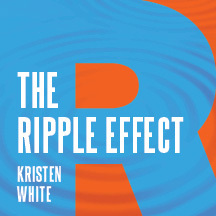 A new purpose and new life is being breathed into a long-vacant former news studio at KDNL-TV in downtown St. Louis, which, after an extensive renovation, will now serve as the set of a brand new type of talk show called, The Ripple Effect. Its host, Kristen White, an award-winning former television journalist and anchor and current business/life coach, author, international speaker and trainer describes the news-style talk show as "Transformational TV," providing a forum for those seeking an alternative to the lack of substance found in much of today's television programming. On the weekly, 30-minute show, debuting December 16 and airing on Sunday mornings in six U.S. markets, White interviews some of the world's foremost experts in personal development and wellness of the spirit, mind & body. "The idea behind The Ripple Effect is that one voice, one sentence or one single 'drop' of wisdom is all it takes to help transform your life. The show is a marketplace of ideas for anyone looking to make a change for the better, either professionally or personally," White says. Since leaving the world of TV news, White has worked with entrepreneurs, professionals and executives of all types to help them succeed in both business and life, providing coaching, training and thought leadership. She is now filming The Ripple Effect in the very studio she last worked in as reporter and morning anchor. Each 30-minute episode of The Ripple Effect will feature three expert interviews as well as a fitness segment, a regular "spirituality boot camp" series and practical tools to use in everyday life. The first show's guests include: Geeta Siduh-Robb, an award-winning entrepreneur, inspirational mentor and founder of Nosh Detox, a successful company that delivers delicious, nutritionally balanced meals straight to your door; and Dr. Sue Ferreria, a retired physician and creator of the program “Live Your Retirement Dream”, teaching Baby Boomers and soon-to-be-retirees how to generate added income in their later years. Following each show, more in-depth interviews with the guests will be posted on the show's website at http://www.kristenwhitetv.com, YouTube, and in the interactive, digital magazine, The Essence of Spirit, Mind & Body on the iTunes App Store.